Living a Fit and Full Life: Find It Games Help Boost Focus and Concentration! Find It Games is part of the Identity Games International collection. The U.S. business branch is managed by industry veteran Brian Maggio and is headquartered in historic Snohomish, WA. Identity Games is an international award-winning game creator, producer and publisher. Identity Games was founded in 1992 and specializes in customized games for B2B, and creates family and children’s games for consumers and distributors worldwide.The mission of Identity Games is to make innovative, creative and educational games for every business, family and market while exceeding customer expectations by delivering high quality games at the best possible prices. From 2006 through 2013 Identity Games has won several awards in The Netherlands, Europe and the US. Did you know? The average human attention span is now eight seconds... Less than that of a goldfish! Focus and Concentration GraphicA recent study by the Microsoft Corporation identified a scary trend: Namely, that the average human attention span has been reduced to 8 seconds – less than that of the common goldfish! It's no surprise that many of us in today's world of constant status updates and myriad demands for our attention could use a little help in improving our focus. While the study goes on to show that humans will ultimately adapt, this is bad news today for kids who struggle with Focus and Concentration – and parents who continue to battle the effects of ever-increasing “screen time”. So our future Superheroes will win out by out-focusing the bad guys. Awesome! As a parent, what can you do to help your kids improve their ability to concentrate? Focus and Concentration GameCertainly, limiting screen time is an easy first step. But then what to do when the screen is put away??? Having the right toys and activities at hand is key to providing alternatives. And one of the best tools you can have is a Find It® Game! 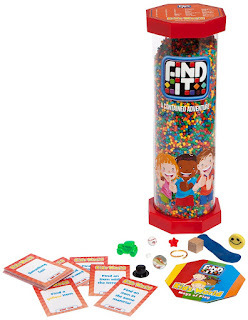 Over 4 million parents have brought a Find It® Game into their home to engage their kids in a “Contained Adventure” that can last up to 30 minutes or more per play session. We’ve seen this first hand at play conventions like “Chi-Tag” in Chicago, where kids from 6-12 years old literally refused to leave our booth until they found one of the elusive objects inside! Now they are also finding a home with doctors, dentists, and therapists – as a tool for attention disorders, behavioral therapy, and beyond. The unique self-contained format and vibrant colors make Find It® great for kids with ADHD, cognitive disabilities, tactile issues, and spectrum disorders. When we began hearing from parents and therapists about how helpful our Find It games are in this area, we wanted to reach out so that more people could take advantage of our games as a tool to boost concentration and focus. From those who just like to keep one at their desk or coffee table for a downtime diversion to parents who use a Find It game when their child has a sensory meltdown, they are useful in countless ways. It's a great travel game, terrific learning center activity or is a fun battle game. The Find It® hidden object game is a brightly colored, educational, Contained Adventure™. It contains 48 hidden items for you to find, conveniently listed on the top of the game. The objects inside range from everyday items to custom designed shapes and images, depending on the theme of the particular version.SPIN IT, TWIST IT, SHAKE IT!Be the first to find the hidden item! This family game is enjoyed by adults as well as children. It is a great travel game, terrific learning center activity, or is a fun battle game.The game comes with colored plastic ends, giving the game an exciting, colorful look and caters towards learning.The package includes the Find It® hidden object game and dice. An educational family game for one or more players to enjoy, whether you are 8 or 98! The Find It® Kids hidden object game is a brightly colored, educational Contained Adventure™. It contains 48 hidden items for you to find, conveniently listed on the top of the game. The items found in this sealed container are geared toward kids. SPIN IT, TWIST IT, SHAKE IT! Be the first to find the hidden penny, marble, balloon, or letters of the alphabet, and so much more! This family game is enjoyed by adults as well as children. It is a great travel game, terrific learning center activity, or is fun played as a timed game with others. The Kids version comes with red plastic ends, giving the game an exciting, colorful look, and caters towards learning. Skills used: deductive reasoning, object identification, early reading/letter recognition, as well as patience. The package includes the Find It® Kids hidden object game, playing cards and Ways to Play sheet. An educational family game for one or more players to enjoy whether you are 6 or 106! We have just expanded our product line to include the pink and fabulous "Glitz & Glamour" hidden object game which caters to girls of any age. Great for young girls, tweens, birthday parties, sleepovers, moms, a day at the spa, and anything GIRL related!! 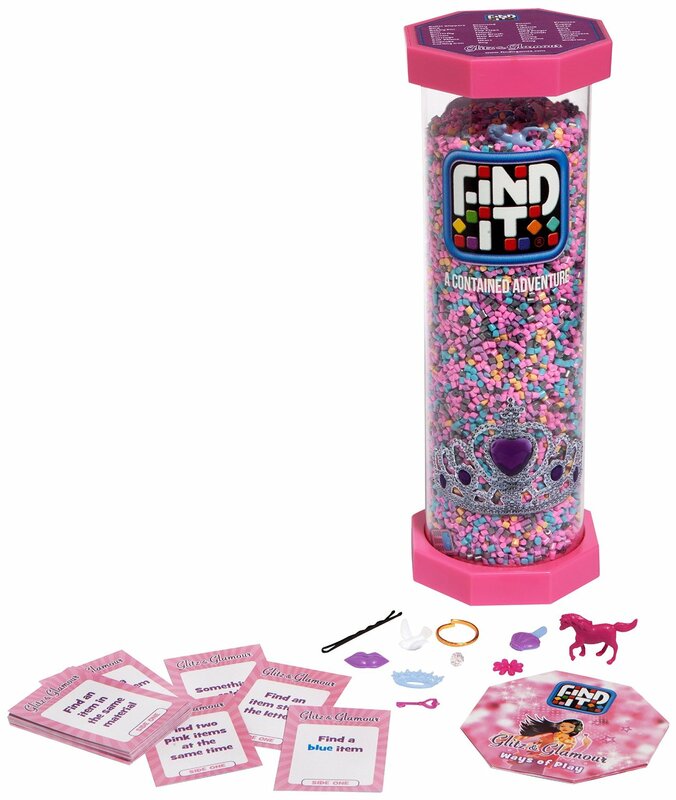 With items like jewels, purse, lipstick, pony, cell phone, high heels, and many more, this pink and purple game is sure to please even the most particular princess! Package includes the Find It® Glitz and Glamour hidden object game, playing cards and Ways to Play sheet. A fabulous game for one or more players to enjoy whether you are 6 or 106! Find It Games are awesome! As a homeschooling mom of four Find It Games are definitely a product I love. Find It Games help boost focus and concentration and I can honestly tell you I've definitely noticed this with my kids. It's absolutely amazing how long my kids will spend playing the Find It Games. Find It Games are extremely easy to play and even my three year old was able to play along. My girls adore the Find It Glitz & Glamour version because it's pink a girly but the Find It Kids version is a hoot as well and would be perfect for both boys and girls. I've also spent hours playing these games with my kids and found it to be extremely fun. Find It Games has quickly become one of our new favorites on family game night. I highly recommend Find It Games! Click HERE to find a store near you that sells Find It Games! Click HERE to learn more about Find It Games! Follow Find It Games on social media!